Something everyone sees, regardless of speciatly, is hypertension. Hypertension affects over 30 percent of adults in the United States, and 65 percent of those 60 to 69 years of age.1 As you can imagine with the number of people affected by hypertension, the annual treatment cost in the United States of hypertension is $47.5 billion.1 Because of this, it's important to know the difference between primary vs secondary hypertension. Today we will not be discussing the run of the mill essential hypertension, but instead, we will be talking about the evaluation and workup for secondary hypertension. Secondary hypertension is a specific type of hypertension in which there is an underlying and possibly reversible cause that is contributing to the elevated blood pressure. Secondary hypertension only comprises around 5 to 10 percent of hypertension cases. If present, it is more often seen in younger patients, with a prevalence of 30 percent in those 18 to 40 years of age with hypertension. 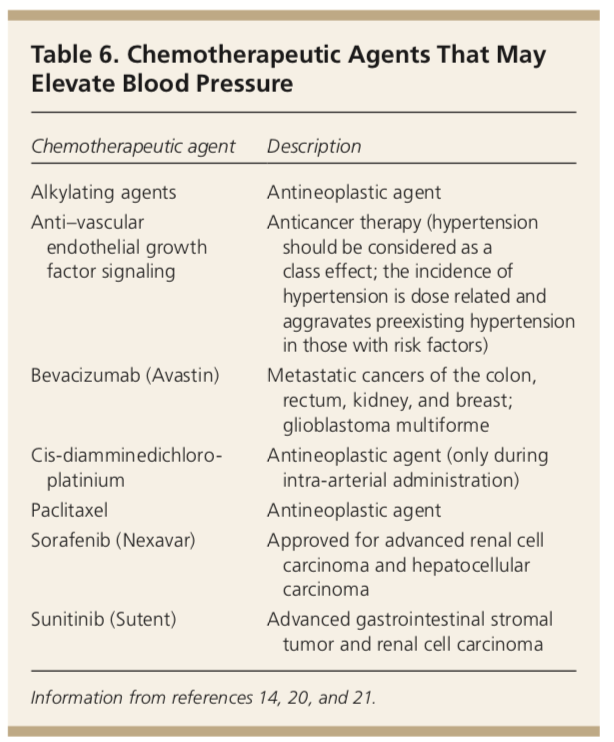 Other instances in which secondary hypertension should come to mind is in patients with severe or treatment-resistant hypertension, malignant or rapid onset hypertension, and with an acute rise in blood pressure from a previously normal baseline. Am Fam Physician. Secondary Hypertension: Discovering the Underlying Cause. 2017;96(7):453-461. Copyright © 2017 American Academy of Family Physicians. The initial step in the evaluation of hypertension, is to make sure the readings you are seeing are are accurate. One should make sure that the blood pressure cuff being used is of appropriate size and is appropriately positioned. The patient should also be sitting in a supported chair, with feet flat on the floor and uncrossed, in a quiet, relaxed room, for five minutes before taking an accurate measurement. Two to three measurements should be taken on two separate office visits to confirm the diagnosis of hypertension. 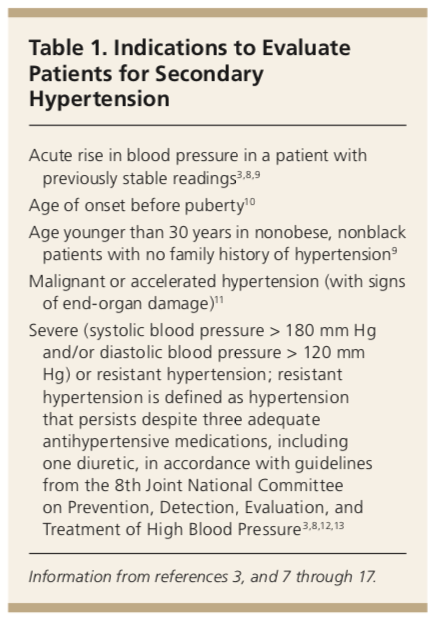 For those who note they have normal blood pressure at home, but elevated readings in the office, a 24-hour ambulatory blood pressure measurement should be completed to assess for white coat hypertension. If the factors above have been ruled out and secondary hypertension is a concern, assessment for underlying physiologic conditions should be completed. 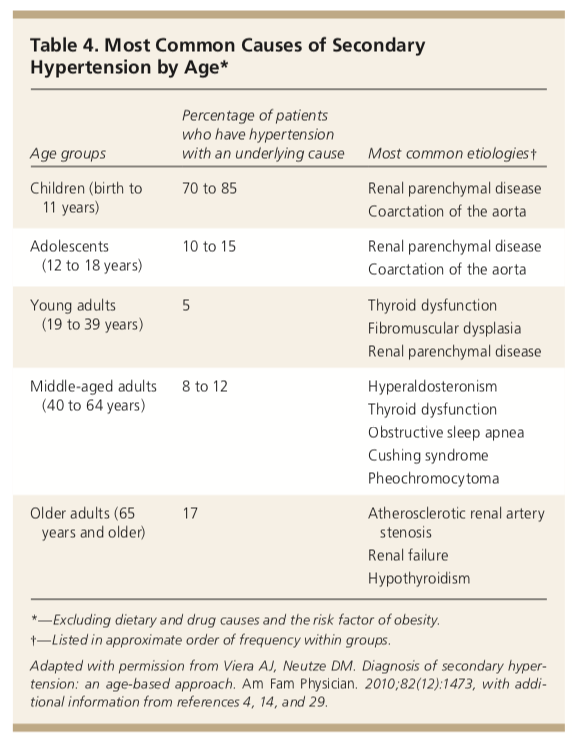 Etiologies of secondary hypertension vary based on age. The most common causes of secondary hypertension regardless of age, include obstructive sleep apnea, renovascular hypertension, hyperaldosteronism, and renal disease. Renovascular hypertension is a common and possibly reversible cause of secondary hypertension. Renovascular hypertension accounts for 10 to 45 percent of severe or malignant hypertension cases.1 This diagnosis is often seen in those with coronary or peripheral vascular disease, including renal artery stenosis (RAS). In young adults, renovascular hypertension can be due to fibromuscular dysplasia. It is recommended by the American College of Cardiology and American Heart Association that patients with possible renovascular hypertension undergo diagnostic testing if they have signs of symptoms of RAS as below. The preferred diagnostic imaging tool for RAS is debatable as well. The standard is angiography with CTA or MRA due to its peak sensitivity, specificity, and detail of vasculature; however, the technique is invasive and should not be used as the initial test of choice for evaluation in adults. Another option is the captopril renal isotope nuclear scan which has a 90% sensitivity and specificity. Overall, invasive imaging should only be done in patients who would consider surgical or radiologic intervention. Another very common underlying etiology of secondary hypertension is renal disease. Hypertension itself can be the underlying etiology of chronic kidney disease (CKD) in adults. Some things to look for on testing in these cases are an elevated creatinine and proteinuria on urinalysis. Renal parenchymal disease is the most common etiology for secondary hypertension in preadolescent children with the underlying causes of disease being congenital abnormalities, glomerulonephritis, and reflux nephropathy. Renal ultrasonography should be first-line for imaging in this age population. Primary hyperaldosteronism is one of the more common etiologies of secondary hypertension. The cause of this disease is due to excessive aldosterone production outside of the regulatory mechanisms of the renin-angiotensin-aldosterone system (RAAS). It is typically caused by adrenal hyperplasia, adrenal adenoma, or adrenocortical carcinoma. Hyperaldosteronism can also be seen in patients that have an excess of growth hormone production, such as in the patient with acromegaly. The main laboratory finding that can be found in a patient with primary hyperaldosteronism is hypokalemia due to the wasting of potassium into the urine. If a patient with hypertension taking no potassium wasting medications is found to have hypokalemia, then a urine potassium test and a ratio of plasma aldosterone to plasma renin concentration should be completed once potassium is back to normal. 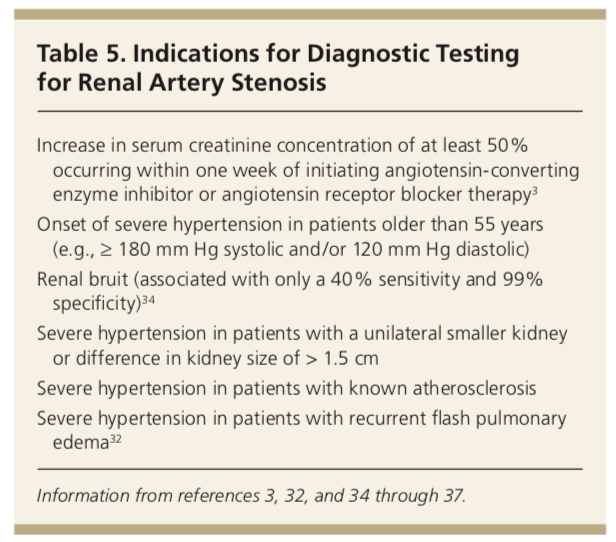 The plasma aldosterone to renin ratio is the most sensitive test for diagnosis of primary hyperaldosteronism because around 25 percent of patients with this disease will have normal serum aldosterone levels. This test should be done in the morning two hours after waking and in the upright position. Medications that should be discontinued prior to completing this test for four weeks including potassium-sparing diuretics, licorice, and NSAIDs. 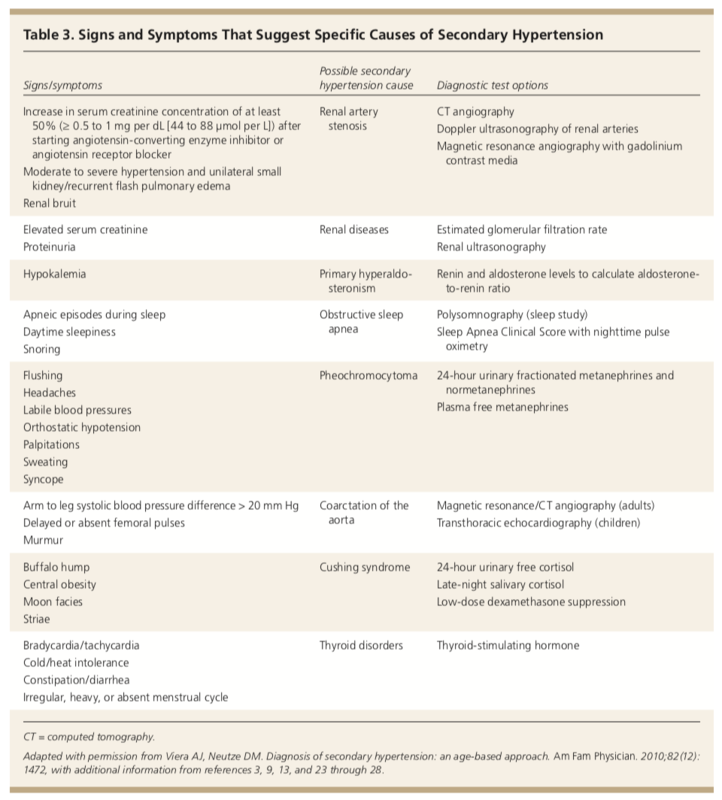 If testing is normal, but there is still a high suspicion of hyperaldosteronism, other medications such as ACEI, ARBs, beta blockers, renin inhibitors, central acting alpha2 agonists, and DHP calcium channel blockers should be discontinued for two weeks and then retesting should be completed. You may be thinking, if I take away all of their blood pressure medications, what can I give them in the meantime? One can treat patients in these instances with verapamil, prazosin, hydralazine, doxazosin, or terazosin. After the diagnosis is confirmed, adrenal CT scan should be completed as well as referral to endocrinology. Another common cause of secondary hypertension is obstructive sleep apnea. OSA is common in men 40 to 59 years of age who are obese and snore. Other symptoms may include fatigue, arrhythmias, headache, daytime sleepiness, personality changes, confusion, difficulty concentrating, or depression. Patients should be assessed with an overnight polysomnography. Patients with OSA retain sodium which makes their hypertension resistant to treatment. In addition, their circadian rhythm is altered so their blood pressure reading may be normal in office but are elevated at nighttime. Treatment of OSA may improve blood pressure, sleep quality, and daytime somnolence symptoms. Pheochromocytoma is a less common etiology of secondary hypertension but should be thought of when patients have random episodes of hypertension with headaches, sweating, and palpitations. Testing can be done with a 24-hour urine or serum free metanephrines. If abnormal, a CT scan should be completed. Cushing syndrome is another etiology of secondary hypertension characterized by central obesity, proximal muscle weakness, moon facies, and ecchymosis. Excessive corticosteroid use causes most cases, but tumors can also cause Cushing syndrome. First-line testing for Cushing syndrome includes any two of the following: 24-hour urinary free cortisol, late-night salivary cortisol test, or low-dose dexamethasone suppression testing. If any of the tests are abnormal, there is a high likelihood of Cushing syndrome, and referral to endocrinology is warranted. Coarctation of the aorta is a common cause of secondary hypertension, specifically in male children. However, it is not regularly detected until adulthood due to it remaining asymptomatic in childhood. Signs and symptoms may include delayed or decreased femoral pulses (brachial-femoral delay), upper extremity hypertension, low blood pressure in lower extremities, and a cardiac murmur. In children, chest radiograph may be normal. An echocardiogram is typically sufficient for diagnosis in children with coarctation of the aorta. In adults, chest radiography may show rib notching. Otherwise, in adults, MRA is recommended for diagnosis. Hyper- and hypothyroidism both can be etiologies of secondary hypertension. Typically, hypothyroidism will cause isolated diastolic hypertension with a wide pulse pressure. Testing with a screening TSH can aid in the evaluation of both of these disorders. Primary hyperparathyroidism can cause secondary hypertension by affecting circadian blood pressure rhythms, renal function, and vascular activity. This should be thought of if a patient’s serum calcium is elevated with a decreased or normal vitamin D level. Progressing with a PTH level can be completed for diagnosis. Certain medications have been known to lead to cases of secondary hypertension. These include chemotherapy that causes microvascular injury that inhibits vascular endothelial growth factor.1 Another class of medication includes oral contraceptives. 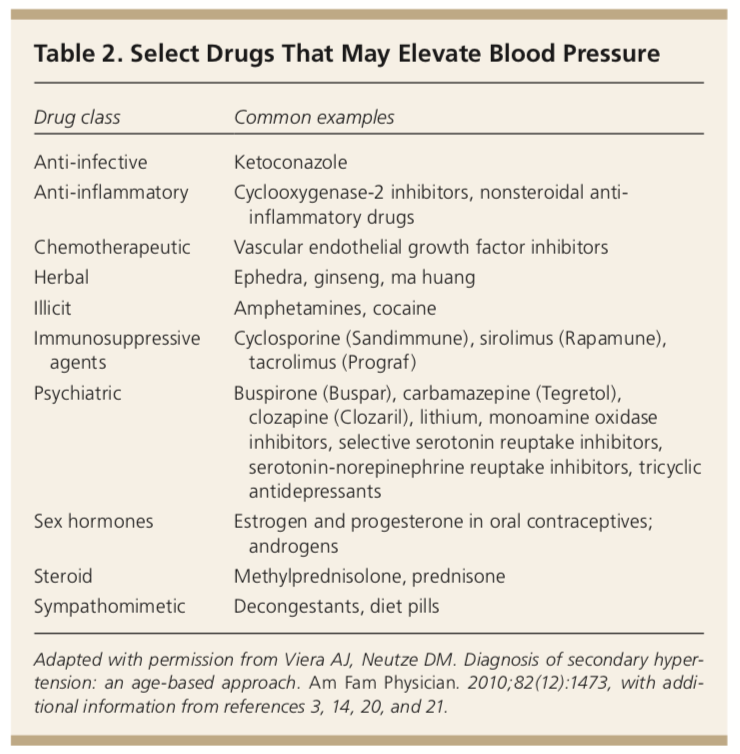 Specifically, those that contain at least 50 mcg of estrogen and 1 mg of progestin have been seen to increase blood pressure. 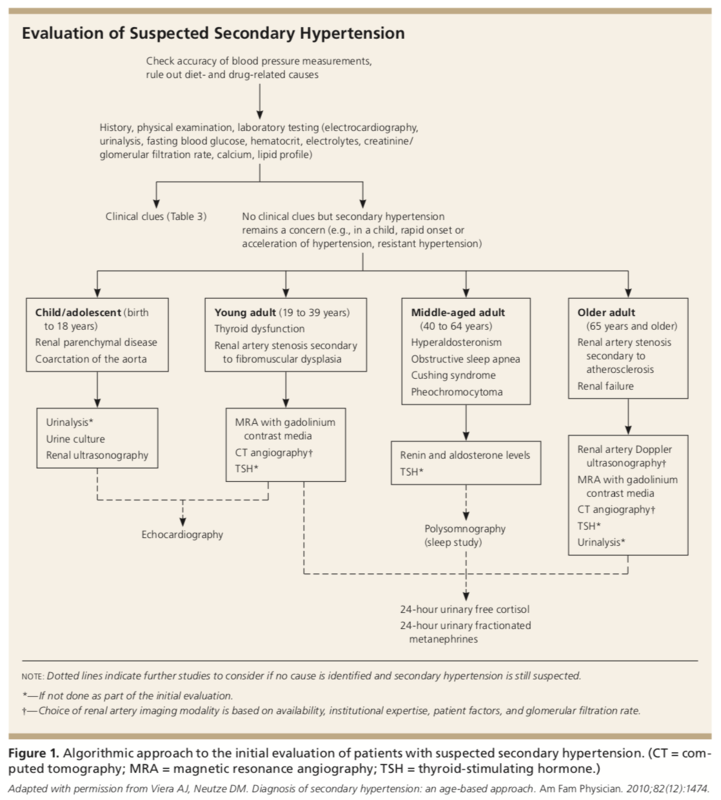 I hope today’s article gave a good summary on how to proceed with the evaluation of secondary hypertension. More often than not, most of the patients you encounter will have ordinary essential hypertension, but make sure to keep your eyes peeled for patients that you just can’t get their blood pressure under control with multiple medications, abnormalities on screening laboratory studies, or other clinical, historical, or physical examination findings that may point you towards an underlying cause. UpToDate. Evaluation of Secondary Hypertension. Accessed: July 4, 2018.